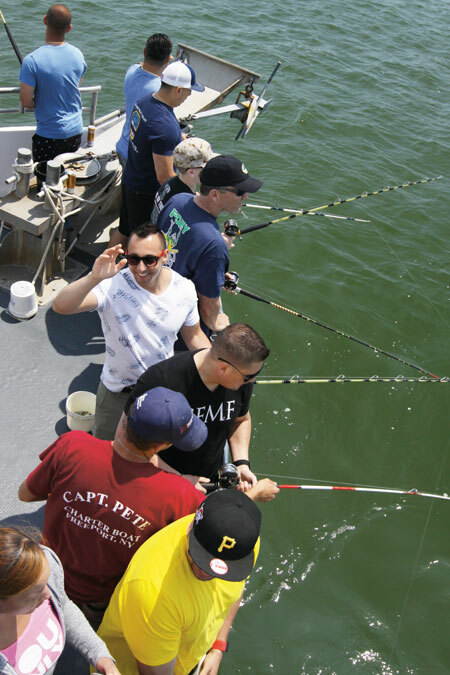 Hooks For Heroes sends American heroes fishing on local party boats with the hope that these trips will help them cope with physical and mental injuries. Pictured above: Approximately 30 members of the FDNY turned out for a Hooks for Heroes event memorializing firefighter Billy Tolley. Bobby Tolley looked past me, out beyond the bow in the general direction of Jones Beach. Ahead of him, toward the pulpit of the charter vessel Capt. Pete, several anglers bounced their rod tips with a rhythmic motion, hoping to tempt some tasty fluke. Behind him, amidships, several more placed their rods in holders and eased their way up front. 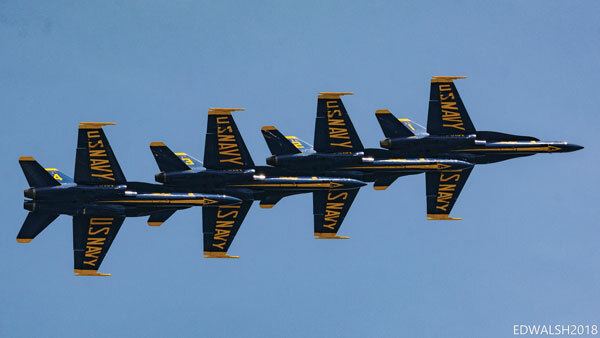 It was Memorial Day weekend last May, and the US Navy Blue Angels were putting on a spectacular show. Flying low across Jones Inlet and east toward Robert Moses Beach, the sharp-nosed planes turned in unison, roaring to the approval of everyone on board before two broke off and powered straight up into the sky. Circling back, they regrouped and came from the direction of Freeport’s Nautical Mile at Woodcleft Canal, racing full speed toward the ocean beaches off our starboard side. There were oohs and aahs as the Angels showed off both their skills and incredible flying machines. “My brother Billy would have enjoyed this,” smiled Tolley, as we watched in awe and chatted about the purpose of the day. 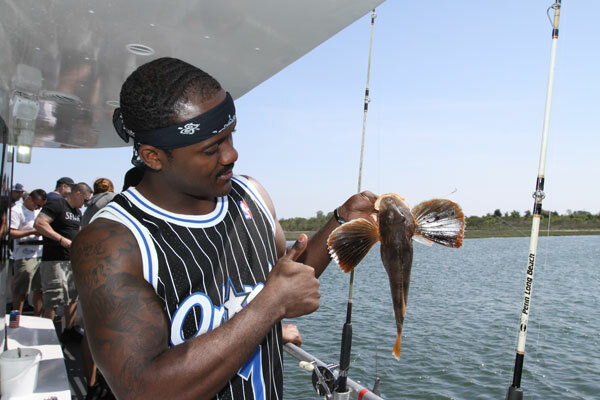 We were relaxing and fishing on Freeport Bay with a relatively new non-profit support program called Hooks for Heroes. The day’s trip was dedicated to the memory of firefighter William (Billy) Tolley, a 14-year veteran of the FDNY, who made the ultimate sacrifice in the line of duty last April at age 42. Tolley perished in a fall while fighting an apartment fire in Queens. He was the 1,172nd member of the FDNY to die in the line of duty. Approximately 30 members of FDNY Firehouse E286/L135, known as the “Myrtle Turtles” turned out for the event. Tolley had been assigned to Ladder Company 135. 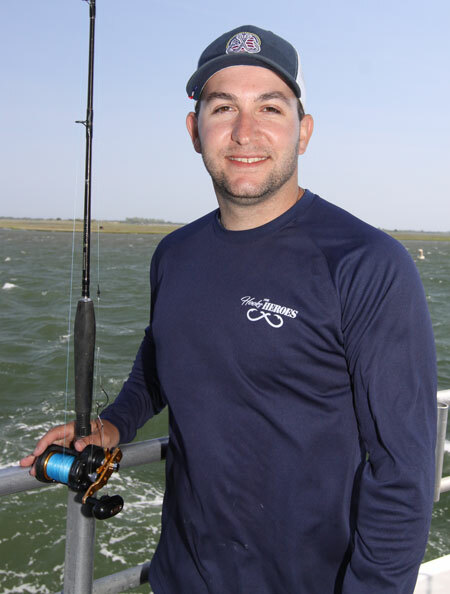 James Torborg is the driving force behind Hooks for Heroes. Torborg knows what he’s talking about and backs it up with current, pertinent data plus years of experience on the front lines. A U.S. Marine veteran, former NYPD police officer and current FDNY firefighter, he has witnessed first-hand the debilitating effects work-related stress can have. As has been well documented in recent years, the negative effects of post-traumatic stress disorder (PTSD) are both real and substantial. Torborg cites a study conducted by the Veterans Administration revealing that an average of 22 veterans commit suicide daily. 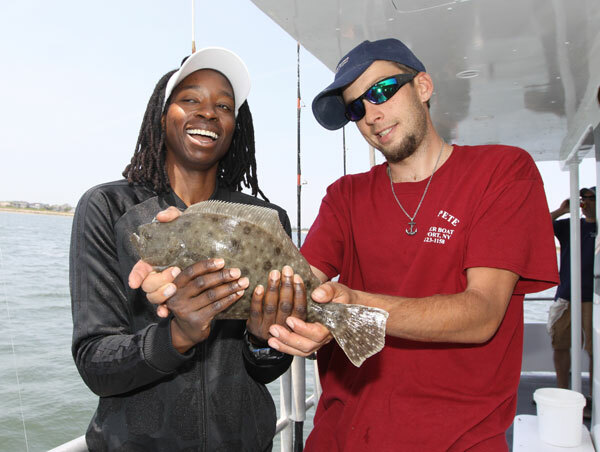 Tyeisha Pugh shows off the first fish of her life with a little help from a mate aboard the Capt. Pete. The program opens its opportunities to firefighters and first responders as well as military veterans. The fledgling operation appears legit. Its management team takes no salaries, the organization is a 501(c) and incorporated in the State of New York, and it spends nearly every cent it takes in on providing trips for those who fit the basic parameters. 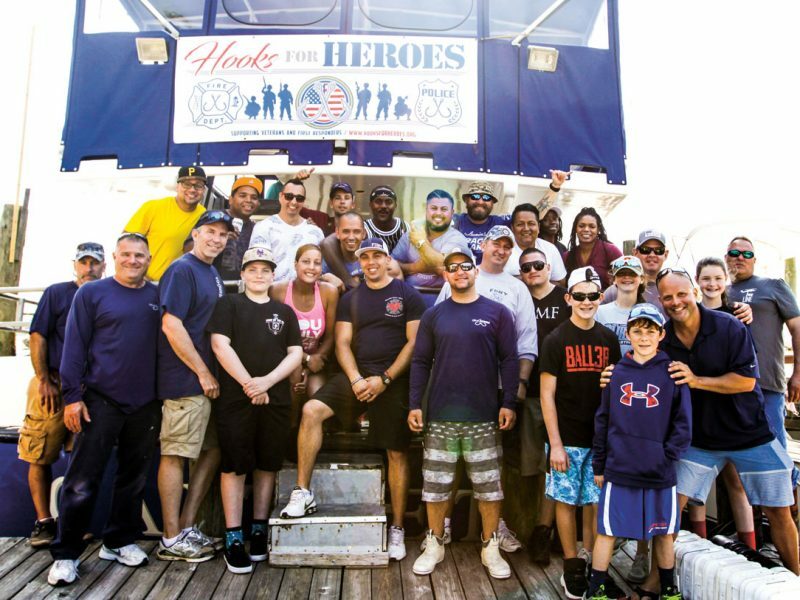 In 2016, Hooks for Heroes provided one fishing trip for six heroes; in 2017, it held 14 trips accommodating 250 heroes. This year, it plans to host 30 trips and hopes to send more than 400 fishing. The trips are organized nationwide, although most so far have taken place in Florida or New York. On this day, the heroes seemed able to lower their guard. Along the port side, Tyeisha Pugh was all smiles after reeling in the first fish of her life. It was a short fluke that had to go back, but it served admirably in its ability to generate high fives and laughter. A few spots closer to the stern, Mark Thomas studied a sea robin he had just lifted aboard before flipping it over the side to the cheers and friendly jeers of his rail mates. In the stern starboard corner, Torborg showed that he could catch as well as organize, decking several shorts for high-hook status on the day—something I witnessed, but he never made known. Back in the bow, Firefighter Ed Shaw, L135, revealed that he and Billy Tolley had been “mutual partners over the years,” meaning that they worked opposite shifts and coordinated with each other to arrange their schedules. The real point of this day, he stressed, was to give everyone a breather, to remember a good friend and fine person while possibly releasing some of the pain. The fishing was tough that day as the gusty winds teamed with a drastically low moon tide to keep the boat in bay waters under unfavorable drifting conditions. A few short fluke, several sea robins and a huge horseshoe crab made it over the rails, but all on board seemed to realize that catching really wasn’t the emphasis anyway. Jay Costa of L135 examines a plump sea robin before releasing it back into the water. With that, he turned his head back toward the stern as the powerful roar of another Blue Angel pass roared across the bay. The jets, four abreast, were flying exceptionally low and speeding straight over the beam of the boat. As they passed, the front jet pulled up and veered away, leaving the others flying in a missing-man formation. Bobby Tolley glanced back over his shoulder and shot me a smile. No words needed to be spoken. For more information about Hooks for Heroes, including how to donate to this worthy cause, visit: OTW 2018 Fishing Tournament Calendar or hooksforheroes.org. would like more info on how my American legion post can sponsor a trip for vets to take fishing. we have the best of both worlds, New Jersey shore, Conn. waters or the Long Island Sound. Fresh fishing reports and great gear giveaways, delivered right to your inbox!